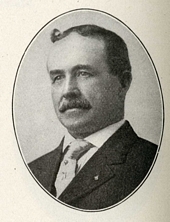 Occupation (when first elected): Locomotive Engineer, Duluth and Iron Range Railroad Co. He came to the United States in April 1880 and settled in Moorhead, Clay County, Minnesota. He moved to Two Harbors, Lake County, Minnesota in 1883. Occupation: Locomotive Engineer, Duluth and Iron Range Railroad Co.